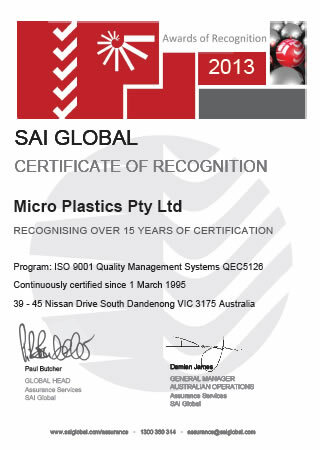 Micro Plastics’ achieved and has maintained an ISO9001 Quality System since its introduction in 1995. Recently receiving a certificate in recognition of 15 years certification. Micro Plastics’ is a custom injection moulding company with a commitment to quality excellence in every facet of our business. Our objective is to produce moulded components at the highest levels of quality to exceed customer expectations. We aim to achieve this goal through the process of continuous improvement along with the use of the latest technology in moulding machinery, calibrated measuring equipment, quality raw materials and components, production control plans (PCP’s) and the active support of our staff. The quality system is regularly audited and evaluated for conformance and effectiveness. Data is collected to ensure measurable quality objectives are being met as well as being reviewed through regular management and production meetings. 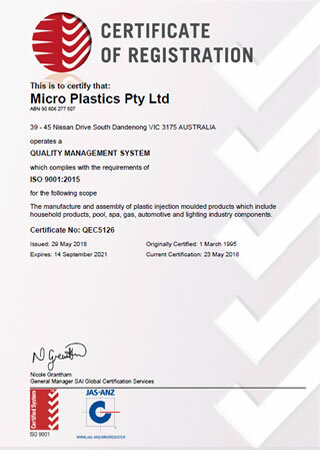 All staff at Micro Plastics’ are one hundred percent committed to the implementation, maintenance and improvement of its quality system so that it complies with the requirements of AS/NZS ISO9001. People, product and customer service, are the core of Micro Plastics’ management goals to achieving a valuable quality system.